This should put the trip into perspective. In stealing the map I neglected to get the scale, but scale doesn't matter in countries like this anyway  what's more important is the number of obstructions between you and your destination. The trip between Hanoi and Hue was theoretically the fastest because it was a train. The regularly-scheduled derailment of the previous train blew the doors off that theory. 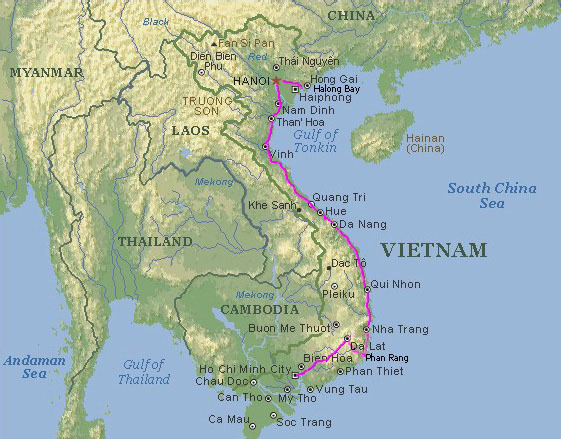 The ham-handed additions to the map (Ha Long Bay, Phan Rang) are mine, as well as the shaky pink line that describes our route.